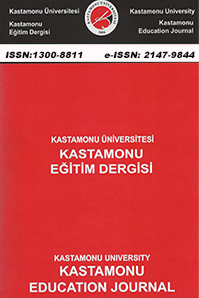 Those manuscripts to be submitted to Kastamonu Education Journal should be prepared according to the following Article Templates. Articles should be at least 2 and at most 15 pages. The editorial board may increase this number if necessary. Font Family: Main titles should be written using 10 pt. and the text 10 pt. Times New Roman font. It should include the aim of the study, its scope, method, results, important features and original value briefly and clearly. There is no word limit for the abstract. Minimum 5, maximum 7 keywords that reflect the whole study should be selected. References should be prepared according to APA 6 – Citation Guide. The in-text references should be given in a way that accords with the language of the full text. For Turkish manuscripts Turkish referencing guidelines and for English manuscripts English referencing guidelines should be observed. Font family is Palatino Linotype and line spacing is 3nk. Indentation should start under the 4th letter. Additional tables, graphics and pictures should be given on a separate page after the references. Each appendix should be numbered as Appendix 1, Appendix 2, ... and each appendix should have a separate title. Authors should pay attention to the template of the examples given in the Template for the titles of Tables and Diagrams and text properties. If the diagrams include a picture or a visual that cannot be edited it should be transferred into Word with 300 DPI resolution and the original diagram should be uploaded via Upload Supplementary Files in the 4th step of Submiting a Manuscript. Since Kastamonu Education Journal claims no fees for article review or printing and for access to articles.